One program in Shoreline is hoping to build relationships between the police department and the behavioral health community by providing training and one-on-one contact. 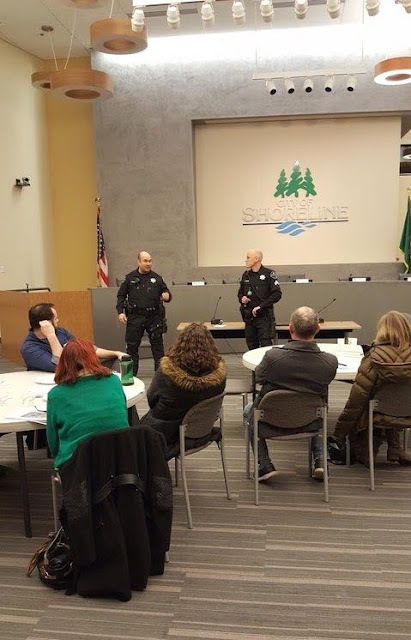 The Shoreline Police Department’s Response Awareness, De-escalation and Referral program, or RADAR, trains deputies to provide safe and effective responses when handling situations involving people with behavioral health problems. Deputy Ben Emmons introduces the RADAR program while also offering advice to community members about their own encounters with people with behavioral health issues at a Richmond Beach Community Meeting on January 10. RADAR is a complement to the mandatory eight hour crisis intervention training required by the state that helps reduce the use of force between police and individuals with behavioral issues and the repeated use of emergency services. Shoreline PD also offers an optional 40 hour CIT (Crisis Intervention Training) program, in which 25 percent of the department is required to participate. This is in compliance with the Doug Ostling Act, which established requirements for CIT training statewide. Ostling, a mentally ill man, was shot and killed in his home by Bainbridge Island police officers in 2010. Responding officers did not know Ostling had severe mental illness when responding to his call for assistance, despite the fact that he had recent, previous contacts with Bainbridge police. “Had officers known more about his BHI, or strategies that might have helped him in a crisis situation, deadly force would have been a less likely option,” RADAR Program Coordinator Kimberly Hendrickson said. Encounters between officers and individuals with BHI occur on a regular basis. In 2015, Shoreline PD responded to over 500 incidences, according to research analyzing King County 911 call center data. In a survey conducted by Shoreline PD, 86 percent of Shoreline deputies surveyed reported having either daily or frequent contact with people with BHI, and 75 percent of responding deputies were not satisfied with the options available to them for handling these kinds of calls. The RADAR response plan lets deputies know, prior to arrival at a scene, that they will be encountering an individual with a behavioral issue. Deputies and a program navigator, who is professionally trained in mental health, work together with community members before crisis events occur. This allows deputies to gather de-escalation information, such as what calms down specific BHI community members. For example, in a meeting with one BHI community member, RADAR representatives found that the individual loves sports and the best way to calm them down is to talk sports with them. People with a behavioral issue often have difficulty complying with instructions. As a result, many encounters between law enforcement officers and individuals with a behavioral issue involve force being applied or other kinds of physical contact, including being arrested or sent to jail. The Washington Post estimates that 240 people with behavioral issues were shot and killed by police nationally in 2016. This represents around one in four of all fatal police shootings. Between 2014 and 2015, there were 27 use of force incidents reported by Shoreline deputies. Around one-quarter of these incidents involved people with behavioral issues, according to data from the RADAR research team. This is a number Shoreline PD believes they can reduce going forward. The other aspect of this is individuals with behavioral issues being taken to jail rather than medical facilities. Meyer gave a recent example of a man with behavioral issues who accidentally stopped a commuter train near Richmond Beach by wandering onto the tracks. “In the old system we would have booked that person for trespassing,” Meyer said. “Now that we have this RADAR program we recognize he did not have criminal intent. His intent was not to mess up the train schedule, his intent was that he likes trains and wanted to be there. Meyer suggests that rather than taking him to jail the better option is to take him to a medical facility to get him the help he needs. Public stigma impacts how people with behavioral issues are treated in their communities. RADAR navigator Susie Kroll says part of the reason individuals with behavioral issues have not received proper treatment over the years is because of lasting stigmas. This includes withholding help, avoiding contact, forced treatment, and segregated institutions. Kroll, who is also a Behavioral Health Clinic Manager, hopes the program will help erase stigmas surrounding BHI. The RADAR program was funded through a Department of Justice grant and King County’s Mental Illness and Drug Dependency tax fund. Hendrickson says the it is self sustainable, and plans to run for many more years. The program went into effect January 1 and will be evaluated by researchers at George Mason University and the Police Foundation in 2018. They will analyze data to determine if there is a decrease in use of force between police and individuals with behavioral issues and if individuals with behavioral issues are calling in less frequently. For more information on the RADAR program, and to see if an outreach visit might be appropriate, contact Kimberly Hendrickson. RADAR representatives still recommend calling 911 when involved in a situation with someone with a behavioral health issue that presents a threat to themselves or other people. Correction 3-30-17: Deputy Meyer's name was misspelled and the first photo identified the wrong deputy. Great article Sam. Improving communication, awareness and knowledge is key!